When I got to know what I CANNOT forget about while planning a CLIL lesson it seemed to be as difficult as driving. To be honest - I don't drive although I have been a happy (?) holder of a driving licence for over 10 years. Therefore, I really think CLIL is fantastic as being much safer than driving (even if I make any mistake I won't ruin my health or property hopefully) it gives me a chance to learn, improve my personality, be more systematic at work. Let me reveal some of the ingredients that a good CLIL lesson must contain to be successful. CONTENT - without "a subject" there is no CLIL. That is, in fact, in my opinion the biggest change in teaching. We move towards curriculum, interdisciplinary attitude. COMMUNICATION - this is what I really appreciate. Our educational system seems to be unaware what a language actually is. It's is not a book full of magic spells! Graduates leave schools knowing perfect grammar, but unable to make a more complicated sentence, ashamed of speaking in a foreign language not to mention expressing their thoughts. COGNITION - coming back to a Polish educational system we will probably see that practically the first serious moment when a young person is forced to self-study is at the university. CLIL uses various techniques of work to widen the span of our cognitive abilities. It is scientifically prooved that bilingual children are more intelligent and learn easier. CULTURE - children will not learn something being far from reality or their interests. There is no place for artificial topics. 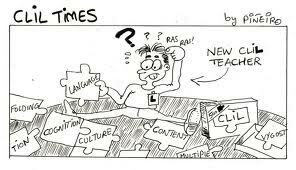 CLIL tries to show the content in a familiar, digestible way. Easy to aplly to students' life and experience. What's more, a good CLIL lesson should end up in a better understanding of students' culture, environment and enhance their involvement as citizens.